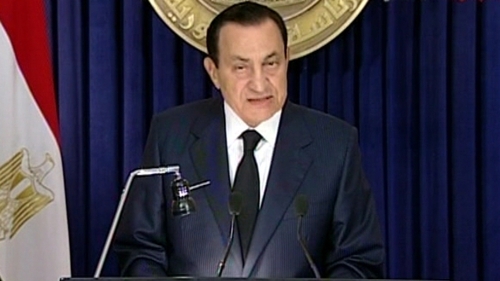 Egyptian President Hosni Mubarak has pledged not to stand for re-election in September, in an address to the nation that came after eight days of anti-government protests. He said the main priority was the stability of the nation to allow the transfer of power. ‘This is my country. This is where I lived, I fought and defended its land, sovereignty and interests, and I will die on its soil,’ he said. He also said pledged to implement a series of reforms, including calling on the judiciary to combat corruption, one of the complaints of protesters who have pushed him to announce an end to his presidency later this year. A presidential election is due in September. At least one million people rallied across Egypt today and protest organisers announced an indefinite general strike until their demands are met. The crowd at Cairo's Tahrir Square grew steadily since early morning, with many protestors sleeping in dozens of tents or on the grass. Crowds also demonstrated in Alexandria, Suez and in the Nile Delta in the eighth and biggest day of protests against Mr Mubarak. ‘He goes, we are not going,’ chanted a crowd of men, women and children as a military helicopter hovered over the sea of people in the square, many waving Egyptian flags and banners. With the army refusing to take action against the people and support from long-time backer the United States fading, the 82-year-old strongman's days seemed numbered. His downfall after three decades could reconfigure the geopolitical map of the Middle East, with implications from Israel to Saudi Arabia. Unrest is already stirring in other Arab countries such as Jordan and Yemen. 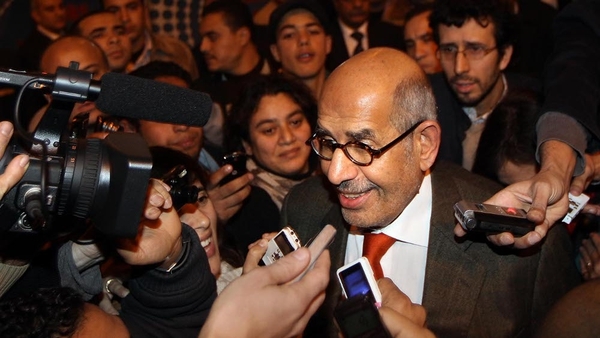 The opposition, embracing the banned Islamist group the Muslim Brotherhood, Christians, intellectuals and others, began to coalesce around the figure of Mohamed ElBaradei, a Nobel Peace laureate for his work as head of the UN nuclear agency. Mr ElBaradei said Mr Mubarak must leave Egypt before the reformist opposition would start talks with the government on the future of the Arab world's most populous nation. ‘There can be dialogue but it has to come after the demands of the people are met and the first of those is that President Mubarak leaves,’ he told Al Arabiya television. Gauging the numbers of protesters was difficult but Reuters reporters estimated it had hit the million mark that activists had called for. ‘Mubarak wake up, today is the last day,’ they shouted in Alexandria. Mr Mubarak's grip looked ever more tenuous after the army pledged last night not to confront protesters, effectively handing over the streets to them. The army, a powerful and respected force in Egypt, said troops would not open fire on protesters and that they had legitimate grievances and a right to peaceful protest. Soldiers in Tahrir Square erected barbed wire barricades but made no attempt to interfere with people. Tanks daubed with anti-Mubarak graffiti stood by.